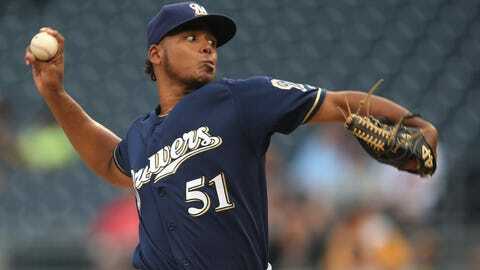 With Freddy Peralta making his next start for the Milwaukee Brewers on Tuesday night, it’s a good time to look back at his last start. Because it was fairly historic. In case you need a refresher, last Wednesday in Cincinnati, Peralta pitched eight scoreless innings, allowing just two hits, walking no one and striking out 11 Reds. How rare was such a pitching stat line? No pitcher has gone at least eight innings allowing two or fewer hits with 11+ strikeouts and no walks issued since Chris Sale did it for the Chicago White Sox on June 19, 2015 (8 IP, 2 H, 0 R, 0 BB, 14 K). By the way, the White Sox lost that game 2-1. Tampa Bay’s Chris Archer (8 IP, 2 H, 0 R, 0 BB, 12 K) was the previous pitcher to put up those numbers, on May 27, 2015 — but the Rays lost as well, 3-0. Thus, Peralta was the last pitcher to win a game in which he had 8+ innings, 11+ strikeouts, no runs and no walks since the Mets’ Jacob deGrom (8 IP, 1 H, 0 R, 0 BB, 11 K) on May 21, 2015. This decade, there have been just 31 games in which a pitcher has toiled at least eight innings with 11+ K, two or fewer hits and no walks or runs allowed. Peralta is the 27th pitcher to accomplish the feat, joining such notables as Felix Hernandez, Roy Halladay, Clayton Kershaw, Corey Kluber, Max Scherzer and Justin Verlander. Another on the list is Zack Greinke, who did it with the Brewers in 2012. In Brewers franchise history, there have been just 18 games in which a pitcher allowed two or fewer hits and struck out at least 10. Greinke has three of those. So does Peralta. Entering Wednesday’s start, Peralta has pitched in 18 major-leagues games, with 16 starts. In his career, he’s allowing just 5.7 hits per nine innings while whiffing 11.1 per 9. There’s only one pitcher in MLB history with more games started than Peralta who allowed under 7.0 hits per 9 and struck out at least 11.0 per 9 over his career — Jose Fernandez (76 starts, 6.8 H/9, 11.25 K/9). And he never had a game with 8+ innings, 11+ K, no runs and no walks.